Histories / Monash Art Ensemble. Gassed Shell (Severe) is my second composition that explores my family's connection to World War One. The piece is dedicated to my grandfather Andrew Maddocks - 'Pop' to his family - who was wounded by mustard gas at the Battle of Passchendaele in Ypres, Belgium on November 1st, 1917. He was a 22 year-old Gunner with the Second Australian Division's V2A Heavy Trench Mortar Battery at the time. The title of the work comes from an entry describing his wounds in his casualty record. The text of Gassed Shell (Severe) intertwines entries from the V2A Heavy Trench Mortar Battery unit diary and Andrew's personal war record, with Wilfred Owen's sublime anti-war poem 'Dulce Et Decorum Est'. Owen's verse begins by describing the mundanity of everyday trench life before moving to the terror and confusion of a gas attack. In the final stanza of the poem, Owen directly challenges the reader, declaring that if one was able to see first-hand the horrendous effects of mustard gas, there would be no support for sending young men to their slaughter. He concludes by deriding the ancient Latin phrase 'Dulce et decorum est pro patria mori' as 'the old Lie'. (This roughly translates as 'It is sweet and fitting to die for your country'). Like so many men who fought, Andrew's experiences at the Great War changed him. The man who returned to Australia in 1919 was an avowed anti-monarchist and trade unionist, and he steadfastly maintained these views throughout his long life; despite the ongoing effects of mustard gas, he managed to live until just six months shy of his hundredth birthday. Although Pop was not the sort of person to dwell on the past, as the years went by, his grandchildren began to ask him about his wartime experiences. He seemed happy enough to reflect upon his time at the Western Front, and I recall Pop describing life amongst the mud and duckboards of Ypres, and the sheer futility of war. His presence loomed large within our family, although this was something that he appeared to not give too much thought. His role in the Great War only served to solidify his position as the benevolent, gruff and revered patriarch. My grandfather's story is common to so many Australian families; indeed to any family affected by the terrible scourge of war. Yet his story is also extremely personal and important to our family. This piece is my small way of paying tribute to him and his memory. Dedication note: Dedicated to my grandfather, Andrew Maddocks. 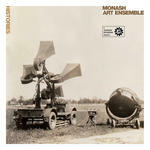 Commission note: Commissioned by Monash Art Ensemble, Paul Grabowsky. 3 Oct 14: Iwaki Auditorium, Melbourne. Featuring Louisa Rankin, Monash Art Ensemble, Paul Grabowsky.